There is common usage (AD, BC), politically correct usage (BCE, CE) and then there is the astronomical counting of years. In archaeology there is YBP (Years Before Present). In sixth century Europe, the concept of “zero” was still unknown. 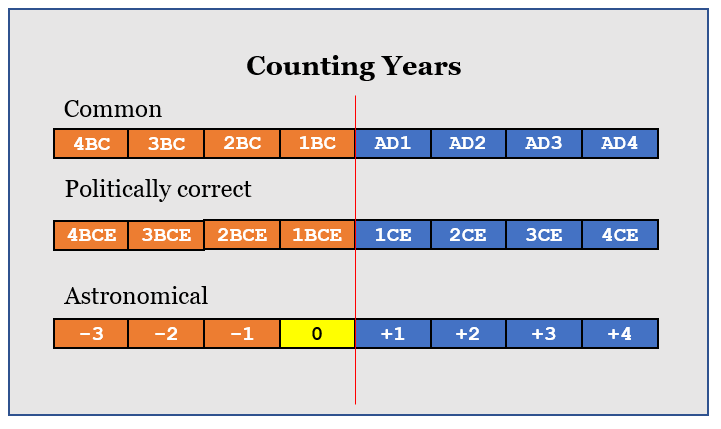 Thus, the year 1 BC was followed by the year AD 1. …… The convention is that “BC” is a suffix (used after the year) while “AD” is a prefix (used before the year). …. ….. (This has been replaced by) the use of the religiously neutral abbreviations BCE (for “Before Common Era”) to substitute for “BC,” and “CE” (for “Common Era”) to replace “AD.” These secular terms are both used as suffixes making them better suited to computer generated tables. This entry was posted on October 25, 2018 at 5:39 am and is filed under Language. You can follow any responses to this entry through the RSS 2.0 feed. Both comments and pings are currently closed.